BM TRADA will be streaming a live fire door test on 17 September, offering viewers an opportunity to see for themselves the crucial role played by fire doors in saving lives and property. 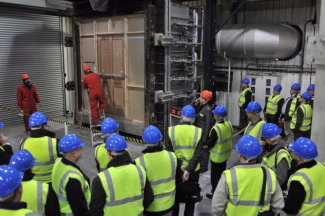 The one-hour fire resistance test will be streamed live from BM TRADA’s testing laboratories in High Wycombe in support of Fire Door Safety Week. It will show two identical doors subjected to a prolonged period of fire. One of the doors will have been correctly specified, installed and fire stopped, while the other won’t. The test will show the significant difference in fire resistance between the two doors, highlighting the importance of correct specification and installation and clearly demonstrating why a door must be adequately maintained throughout its life. Access to the live stream will be via a password protected link. For details of how to register and receive login details, email Charlotte Rutt: crutt@bmtrada.com. Fire Door Safety Week, organised by the British Woodworking Federation and supported by BM TRADA, takes place between 16-21 September. It aims to draw attention to the crucial role played by fire doors and to point out the dangers when fire doors aren’t specified, installed or maintained correctly. The week will be marked by a series of events and promotions supported by trade associations and their members as well as local Fire and Rescue Services, local authorities, landlords and other sleeping accommodation providers.